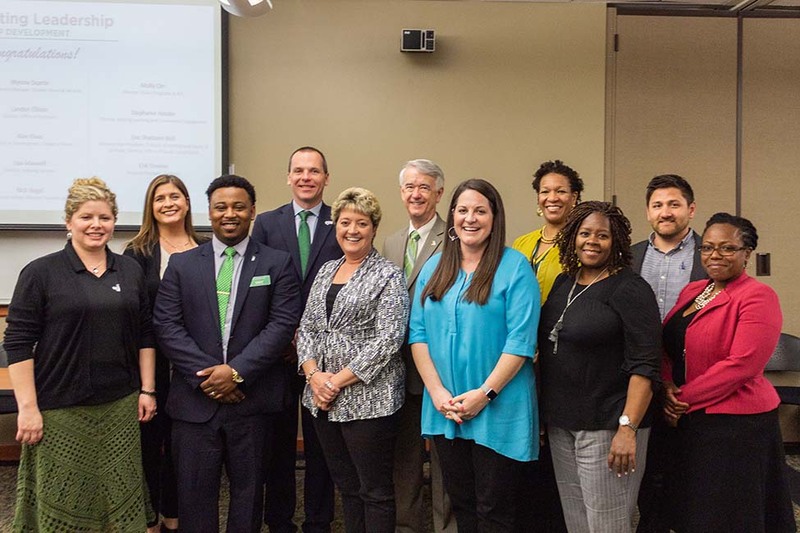 Two UNT Division of Student Affairs staff members, Aundrea Caraway, assistant director of transition programs, and Molly Orr, director of union programs and arts, graduated from the Navigating Leadership Program on March 21. This new program at UNT is a partnership between UNT leadership and UNT System Talent Management, Talent Development group and follows the success of the on-going Supervisory Building Blocks (SBB) Program, which has more than 330 graduates. A similar program has been running in Dallas since 2015, and one started at HSC this past fall as well. This program was developed for front line, high-performing supervisors and group leaders who already have a good handle on their basic supervisory knowledge and are looking to expand their leadership skills, personal awareness and team effectiveness. It consists of 12 sessions, which include leadership speakers in the morning of most session days. The style is that of an active learning program, where participants create their own blueprint for leadership to impact their success and that of the campus. The program’s focus is on self-reflection: creating leadership goals, motivation techniques, coaching, communication skills, employee performance and more. The Navigating Leadership Program cohort members were nominated by their divisions (up to two from each division for this prestigious inaugural 20-member cohort), and travelled together on a seven-month journey towards its completion. “The Navigating Leadership Program has been a great opportunity to not only gain new resources and perspectives on being a leader, but it has also helped me create valuable relationships with colleagues across campus who are part of the cohort,” said Orr.